Recently my bandmate Shaun from Electric Villain got me hooked on building bass effects pedals. I was pretty intimidated at first but it turns out it’s not so bad and is actually really fun, likely due to the IKEA Effect. There are awesome sites like Build Your Own Clone that design schematics and then create kits with fairly easy to follow instructions. Do note however, some basic knowledge of electrical engineering and how to solder is required. After spending some time analyzing my playing Shaun and I determined that I could probably use a compressor pedal. 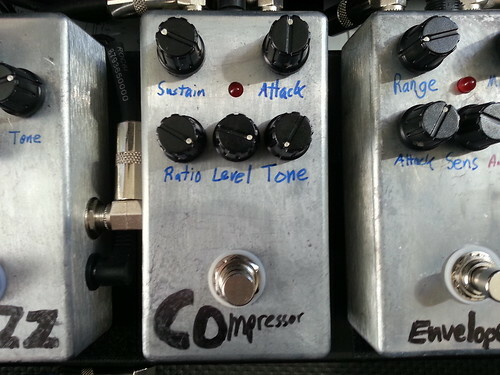 A compressor can be used to smooth out the “attack” and “release” of an instrument. I’m not going to go into detail since there are plenty of YouTube videos that demonstrate what they do. Initially I built a simple two knob compressor but I didn’t like the sound and it didn’t give me a lot of flexibility. To replace it I decided to build the BYOC Five Knob Compressor which provides the usual knobs for more customization. I annotated my Flickr photos pretty well so rather than describing step-by-step how the build went, I’ll just leave you with the gallery. Be sure to read the bottom of the pop-up box for details about each picture! And that’s how I built my bass effects pedal. I don’t have any action shots of me soldering because it would have been pretty difficult holding a camera while trying to solder. If there’s interest, maybe next time I build one I can make a video. That might be a while though because I’ve already built a handful as you can see in the final shot below and don’t have any others in mind at the moment. As far as the pedal is concerned, I haven’t had the chance to dive too deeply into its settings. I found one set that sounds pretty good and have left it there for the time being. It definitely makes a difference though and rounds my sound out nicely.